Most conventional power craft cannot fulfi ll the demanding task of supporting the 72-ft. Americas Cup catamarans that can accelerate to 40 knots in seconds. The power boat ride quality has to allow for keeping up with an AC72 for an en- tire day, regardless of how fast the sail boat is going or what the sea conditions are like. The objective is to have a high speed craft that does not fatigue the crew and keeps the team’s paramedic and dive crews ready for action. This is high stakes racing with multi- million dollar investments by owners and sponsors. With money of less object than usual it is interesting to compare the various designs that the teams selected as Chase Boats. The racers also require a high performance Umpire Boat capable of following close to the action and pro- viding instant visuals of the competition as it unfolds. Scarab offshore racing design and can achieve speeds greater than 60 knots. Smith of Team Scarab to develop the de- sign. Team Scarab has a 30-year heritage of designing and building world cham- pion offshore race boats. The Interceptor was initially prototyped in response to a request by the U.S. Navy for a high-speed combat mission boat. The 43 Assault is also ideal for intercepting and boarding boats and vessels in the open ocean. Wil- lard worked closely with Team Scarab to refi ne their Deep V stepped hull design in order to meet the U.S. Navy require- ments, including shock mitigation seats and light weight engines. The Interceptor also has a Supplemental Stability System (S3) that increases the stability, passen- ger comfort and safety of heavily loaded high speed craft. The variable geometry of the sponsons increases hull effi ciency and aft buoyancy where the fuel, engine and passenger loads are. San Francisco Bay at up to 45 knots. Zealand for the 1992 event in San Diego. RHIB more than 40 feet specifi cally de- signed to carry the large fully battened mainsails, unique at the time to the IACC class of Americas Cup race yachts. RHIB vessels for towing and pilot boat use. ETNZ chase boat is powered by four 300hp Yamaha V6 four-stroke outboard engines and has a top speed of 58 knots. The fi berglass hull is topped with in- fl atable tubes allowing it to slip in be- side the AC72. The ETNZ boat includes a protected main deck cabin, head, and large storage area under the foredeck. The craft has four engines to deliver the power needed to right a capsized AC72. Running all four engines at 3,000 rpm gives 30 knots and the boat uses 100 li- ters of fuel an hour. The boat holds 1,700 liters of fuel which gives a range of 510 nautical miles or 17 hours running time at 30 knots. Golden Gate Bridge. Wash from the spectator boats did not have a great ef- fect on the race course as the Bay is so busy with commercial traffi c and ferries. 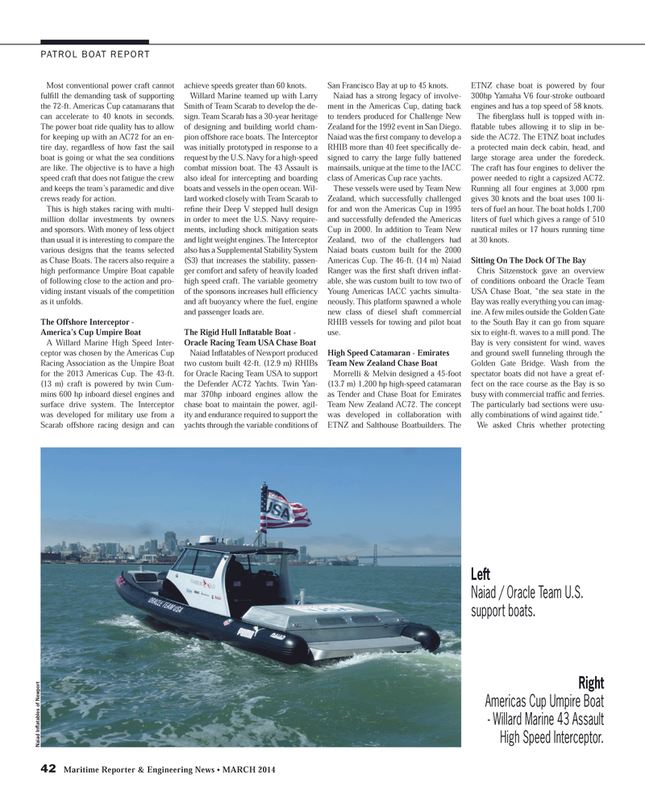 Naiad / Oracle Team U.S. support boats.